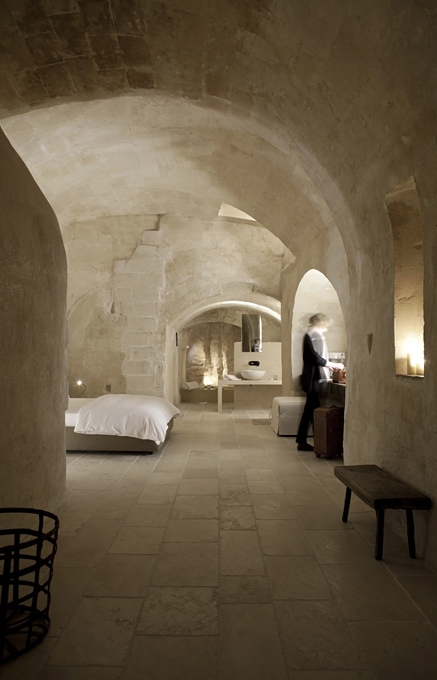 Recognised by Unesco as a World Heritage Site, Italy’s Matera enchants with passageways and courtyards, walls and towers, warehouses and cellars, cisterns and houses—all carved out of soft limestone. 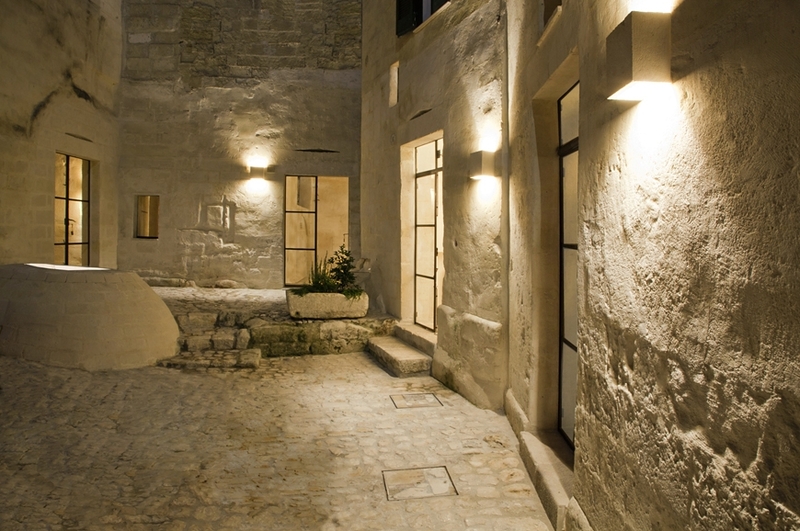 Corte San Pietro hotel occupies one of these dwellings. 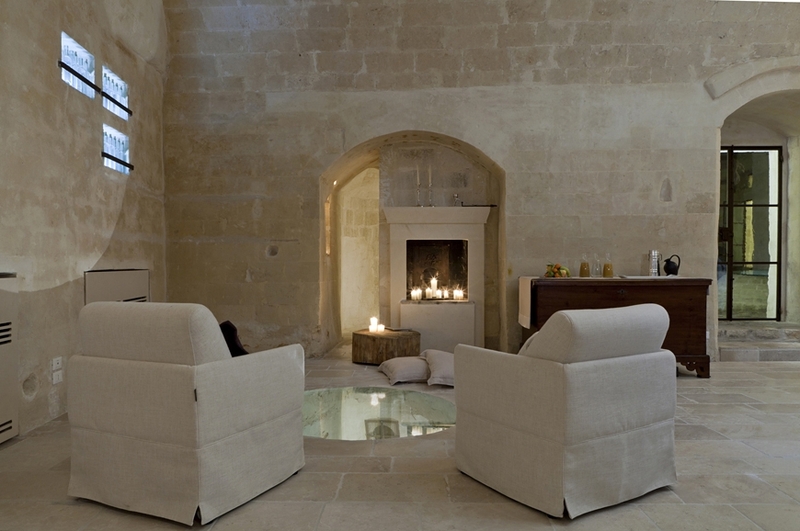 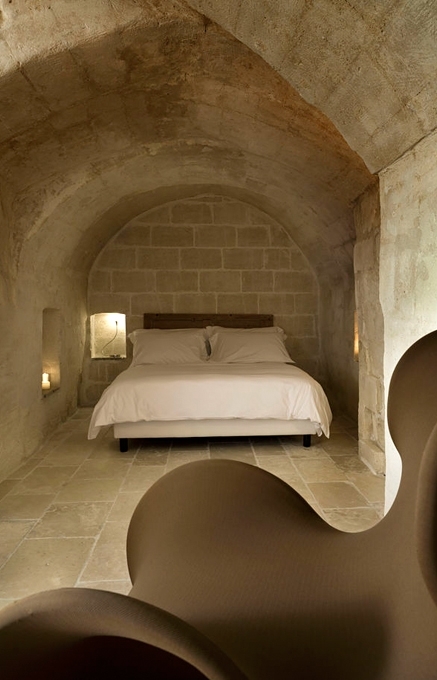 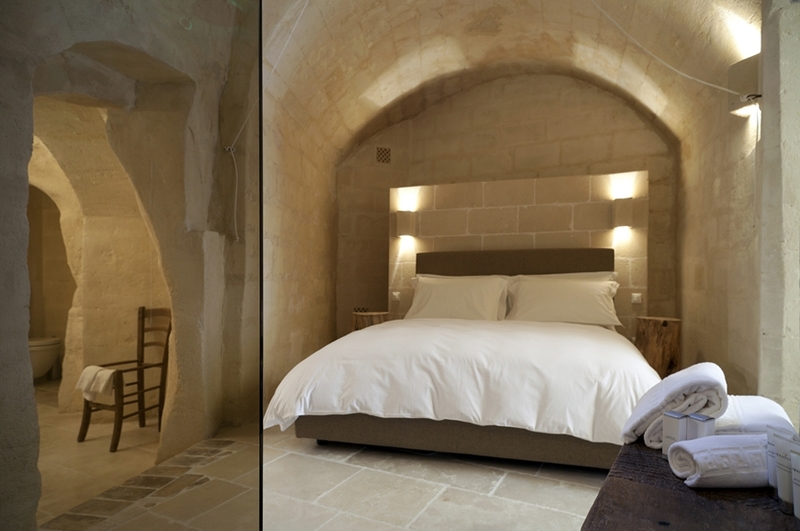 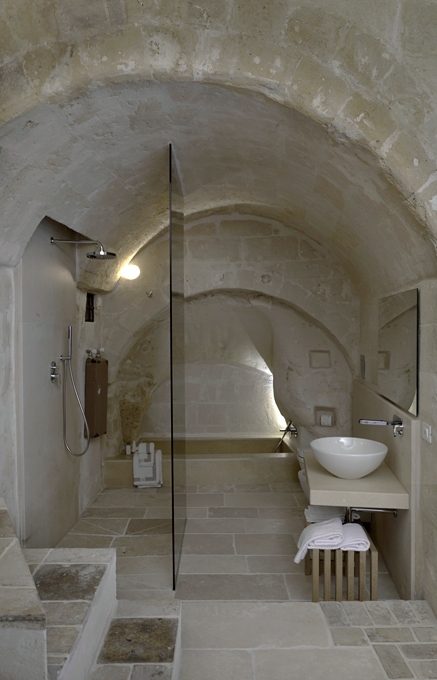 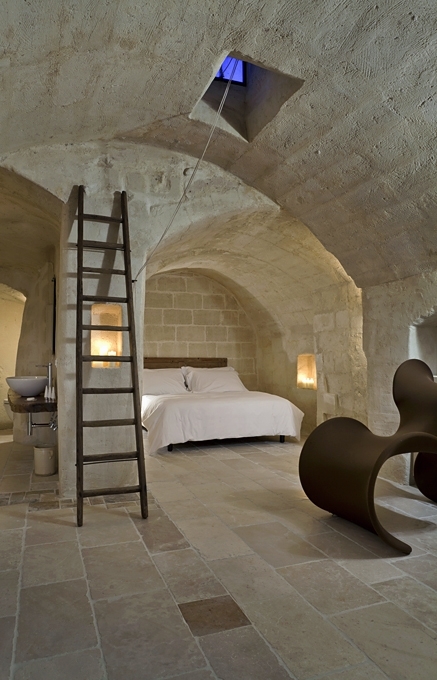 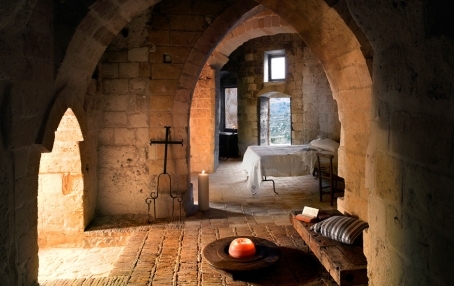 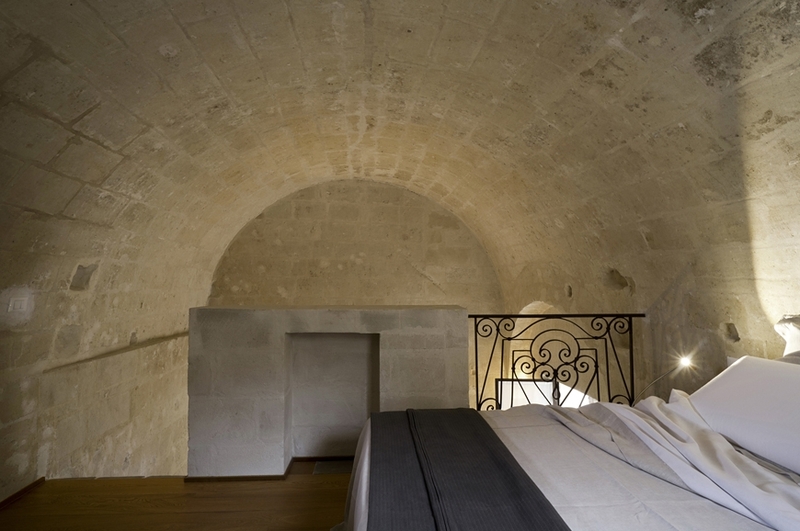 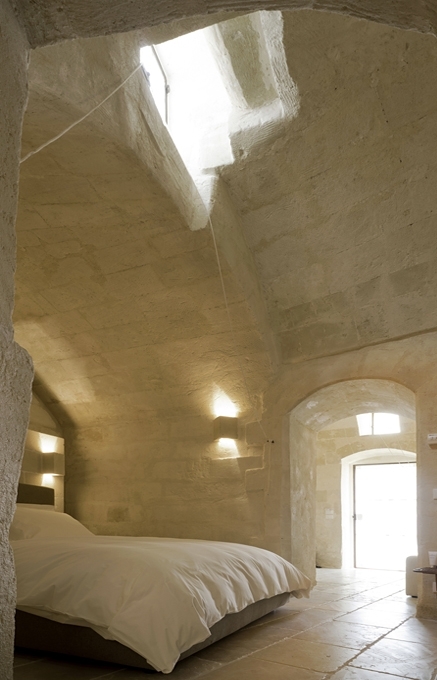 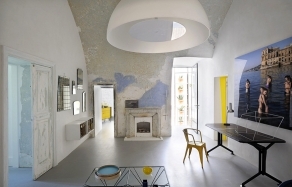 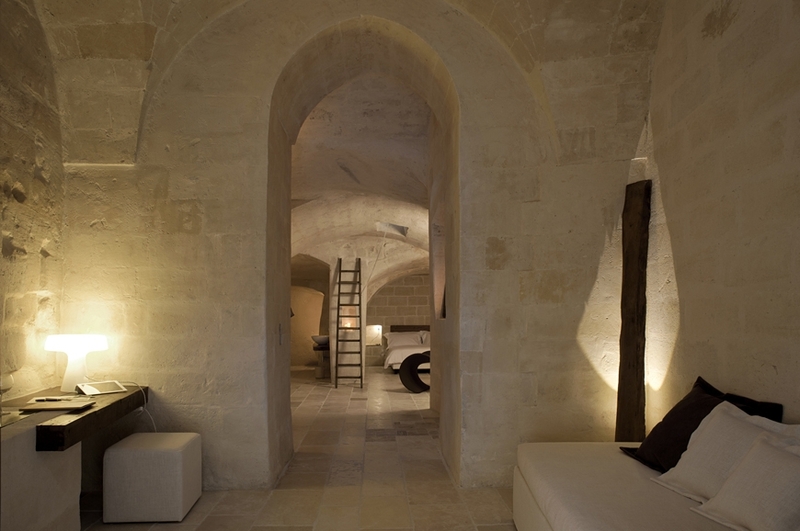 As the architect Daniela Amoroso stood before the task of turning an abandoned collection of caves into a contemporary hotel, she must have asked herself: what could possibly give justice to the incredibly ancient heritage of Matera? 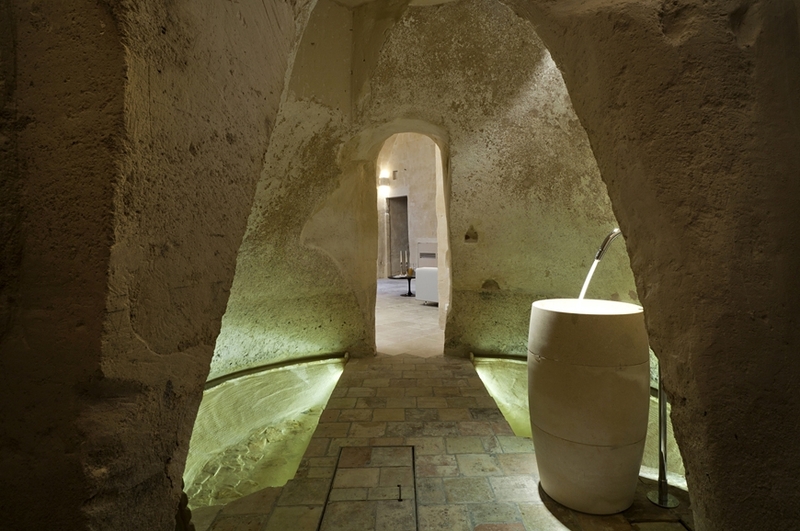 The answer lies in the respect she paid to the organic architecture of the caves. 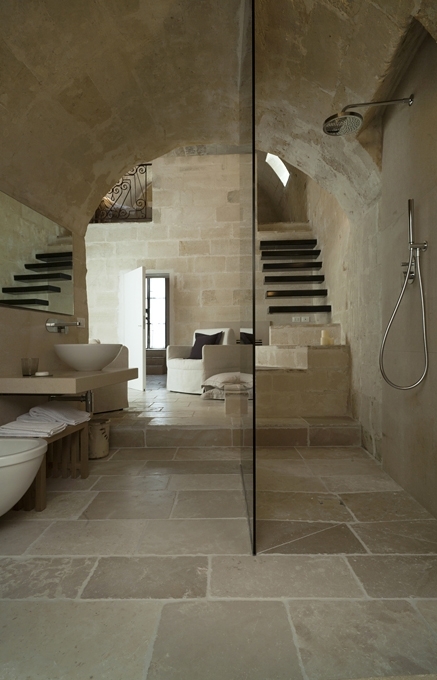 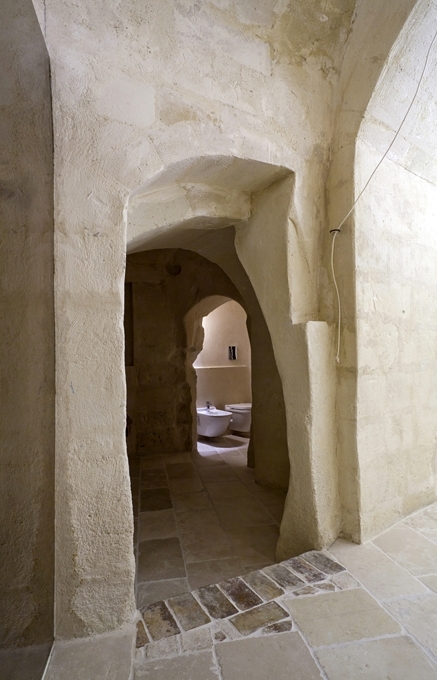 Amoroso stripped the stone to its bare fabric, removing superfluous layers of plaster and pavements. 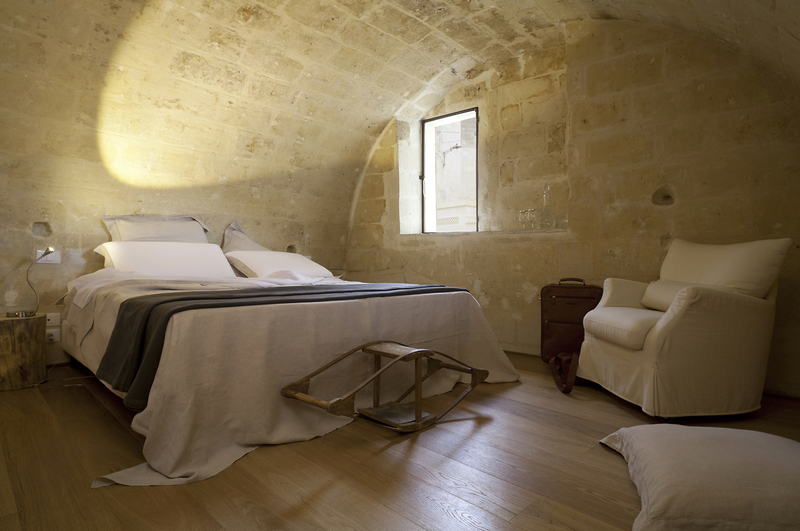 The pure spaces were then discreetly enhanced with vintage furniture and warm materials: wood, linen—and steel, in one more nod to the local traditions. 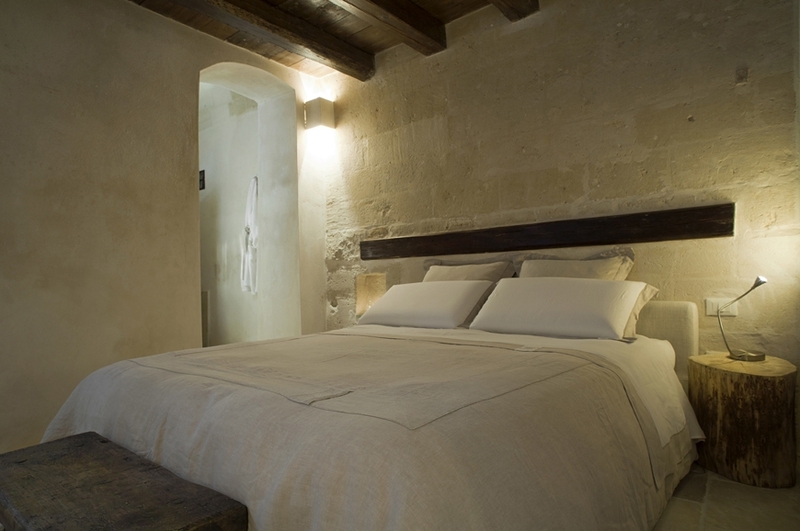 Corte San Pietro is only five rooms and suites with reception hall and a breakfast room all arranged around a central courtyard. 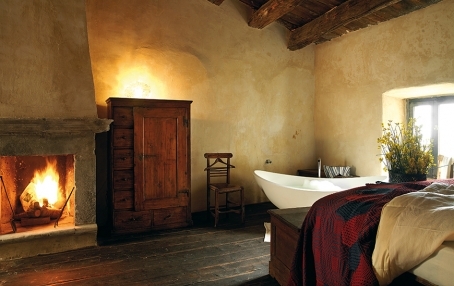 Each room is unique with timeworn furnishings. 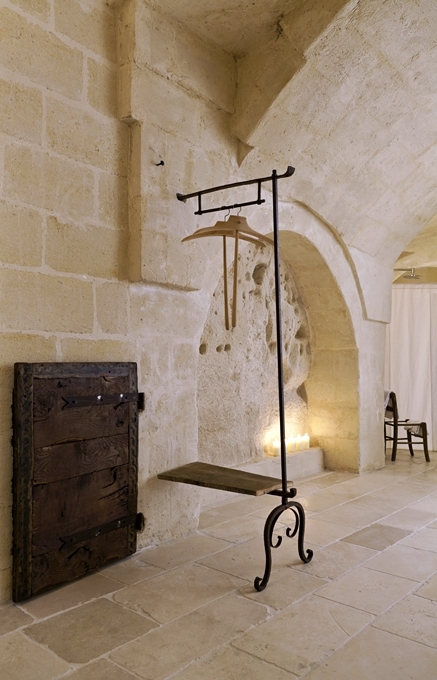 Old benches, chairs, frames or doors get a second life at Corte San Pietro, becoming shelves or tables, or even towel holders. 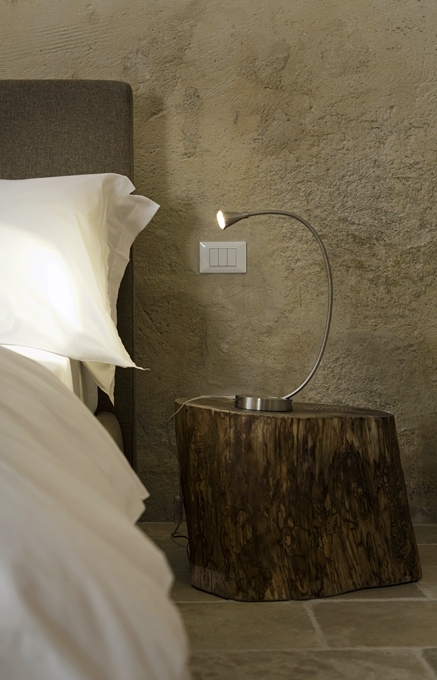 Tree logs are used as bedside tables or stools. 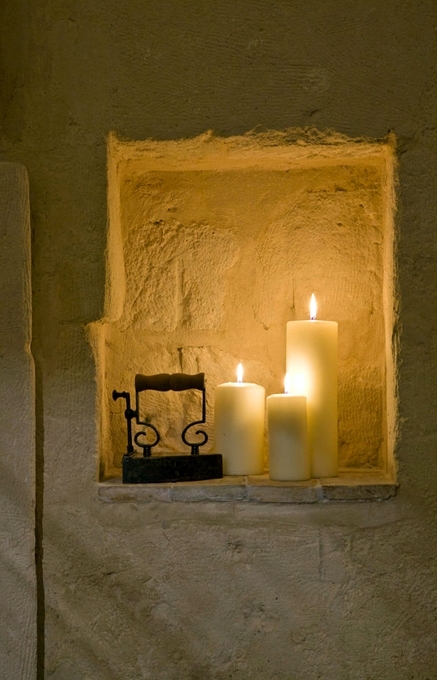 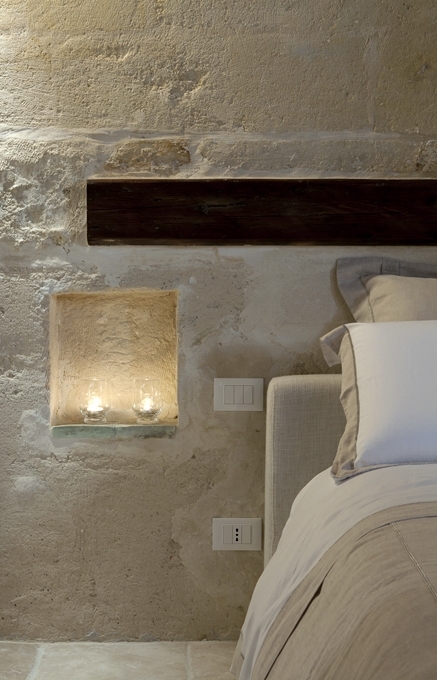 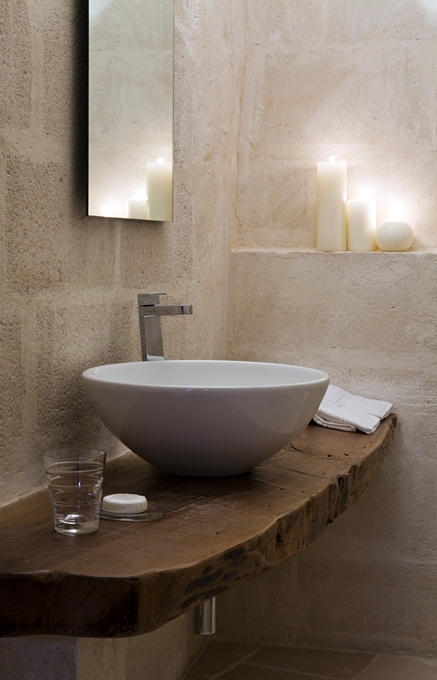 The simple décor compliments the soft stone and is deliberately kept in a monochromatic palette. 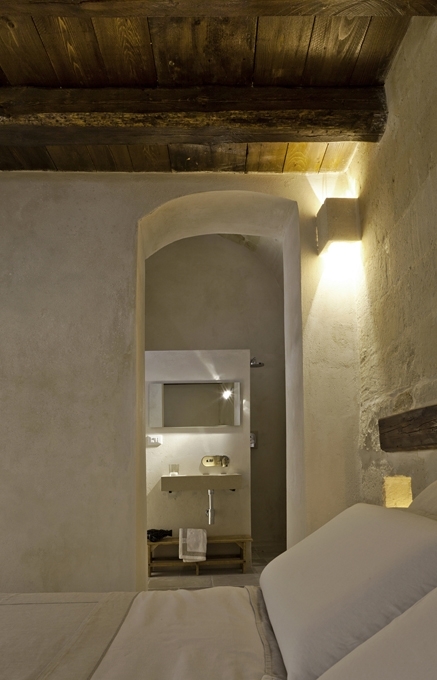 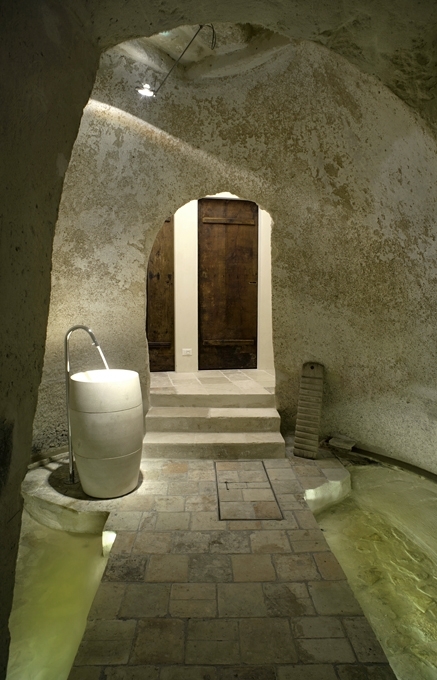 Rural and minimalistic, ancient but modern—the ascetic style of Corte San Pietro creates thoroughly contemporary spaces, with modern technology ubiquitous, but fittingly invisible. 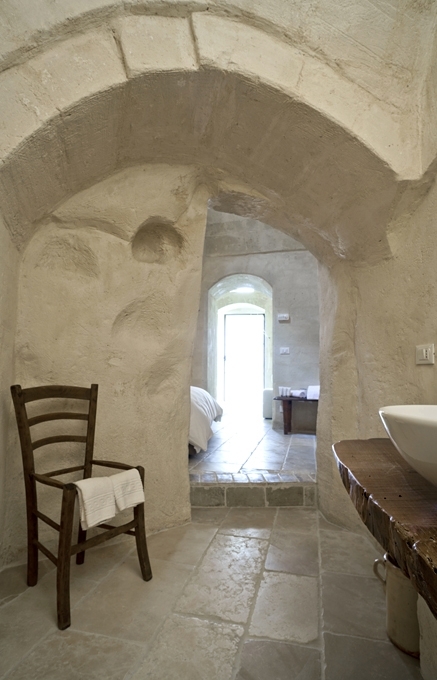 The Corte San Pietro is a conversion and restoration project—but the architect has been just as much focused on excavating the original, organic curves of the cave dwellings. 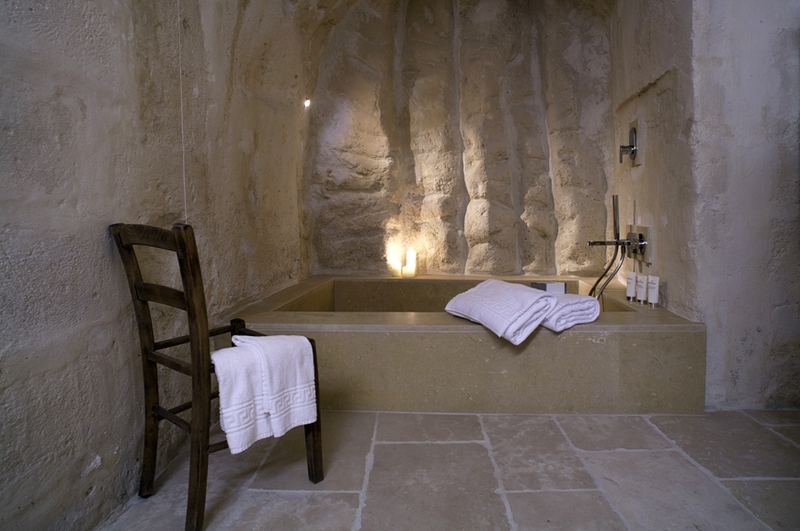 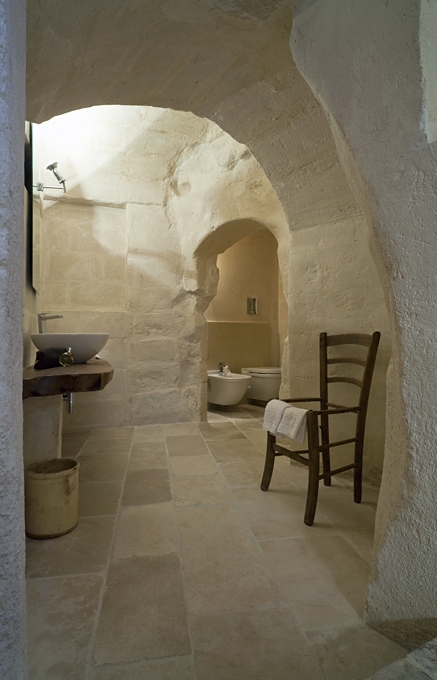 The stone ceilings and walls, wrapping around natural columns and niches are true to the prehistoric legacy—the legacy of time that began sculpting the caves of Matera long before humans walked the earth. 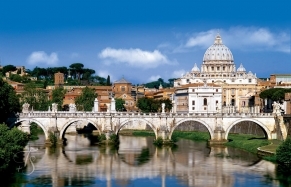 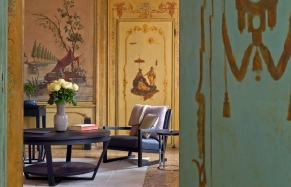 Find out more on the Corte San Pietro website.